Ever wished you could have that luxurious hotel quality feel home? 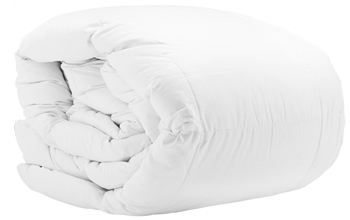 This European white goose down duvet is ideal for use in Autumn, Spring and the coldest Winter months. It has a baffled cassette construction with maxi-loft outer walls using a luxurious and soft 380 thread count sateen cotton down-proof casing. It is filled with European 85% White Goose Down and has a High Thread cound of 380TC Down Proof Cotton Casing for Luxury Feel. It also has Doubled Sateen Piped with outside walls and Baffled Cassette Walled Quilting Design that provides Excellent Lofting Ability.